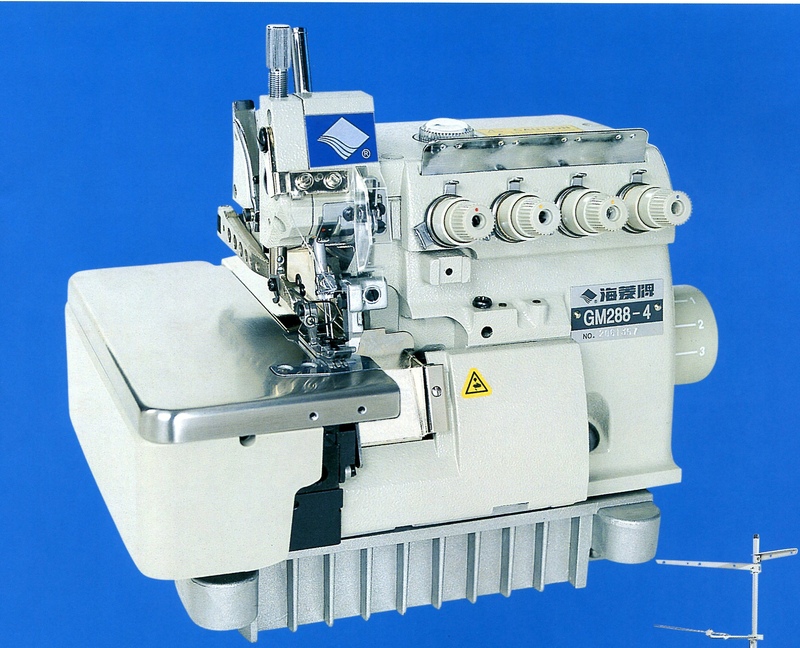 High speed single needle lockstitch machine with jumping foot. 30" arm length for ease in handling large panels. Built in direct drive electronic needle positioning servo motor. 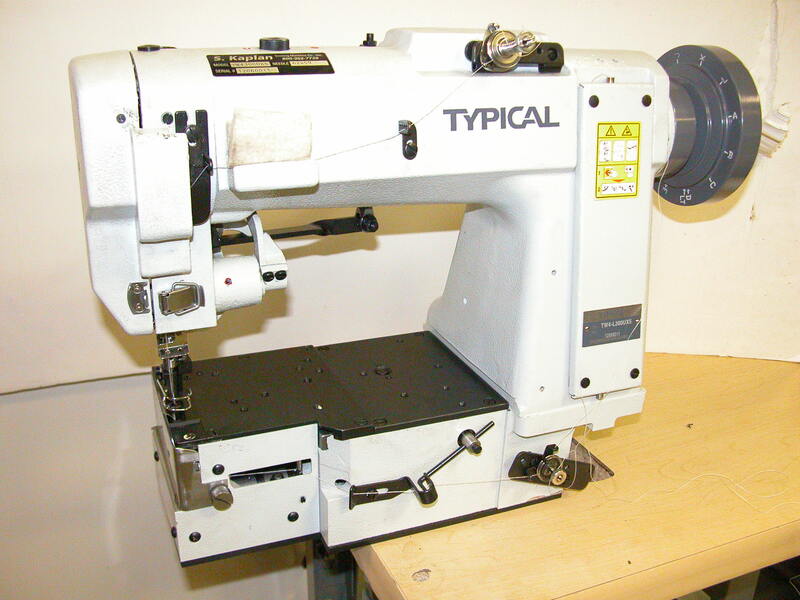 Automatic thread trimming and presser foot lift. Oversize (47" x 82") table for ease in handling large panels. 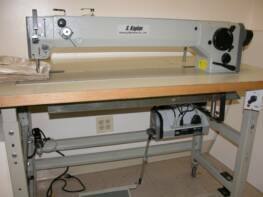 Single needle lockstitch zig-zag sewing machine with reverse feed. 30" Long arm. Specially designed presser foot, feed dog and needle plate. Stitch adjustable up to 3/8" wide. 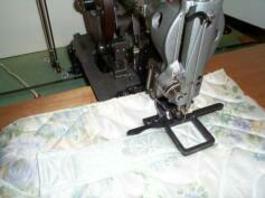 Sews panels which will compress to 5/8". Horizontal axis transverse rotary hook. 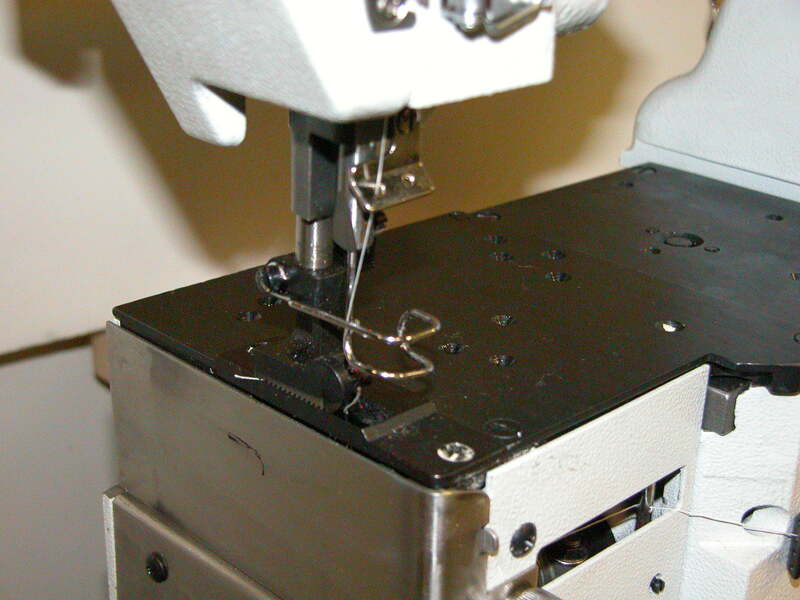 High speed single needle chainstitch machine. Binds mattress panel to border before tape edge operation. Available with binder, fittings and swing brackets. Interchangeable binder sizes 5/8", 7/8", 1", 1 1/4" & 1 1/2". 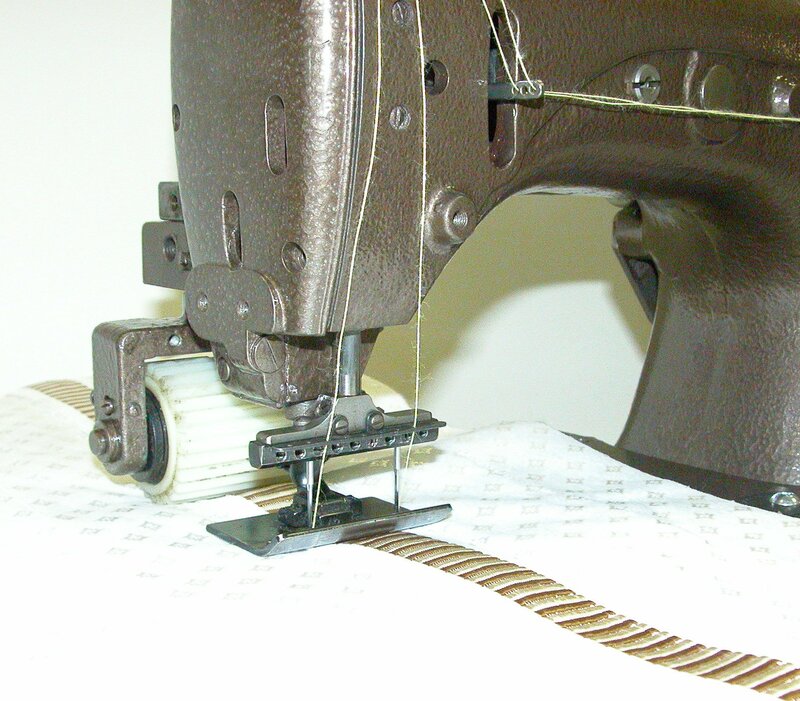 High speed single needle, chainstitch machine. Binds mattress panel to border tape edge operation. Available with binder, fittings and swing brackets. Interchangeable binder, sizes 5/8", 7/8", 1", 1 1/4" & 1 1/2". Available with walking foot for thickest panels. 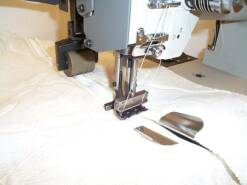 Multiple needle chainstitch machine to produce continuous handles in a variety of widths & styles. Available with optional cutter and can be fully automated for unattended operation. Used for sewing mattress handles to the border in the second step of the handle operation. Available for horizontal or vertical handles. 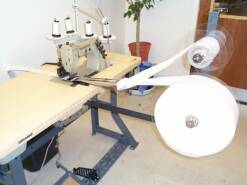 High speed true tandem needle machine for closing mattress borders in one pass. Two loopers and two needles positioned one directly in front of the other. Easily set up for use with FR thread. Economical replacement parts in stock. 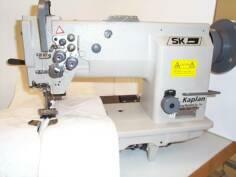 The SK- Union Special 56300FTE Faux Tape Edge Sewing Unit consists of a high speed chain stitch sewing machine head with synchronized puller for pucker free sewing. 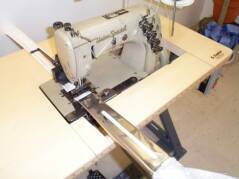 Sews with or without binding tape; faux seams pass flammability test. Adjustable folder accommodates different width borders. Available as an economical manual sewing unit or fully automated with electronic needle positioning motor, stops for thread breakage and raw material depletion. Optional rewind unit. 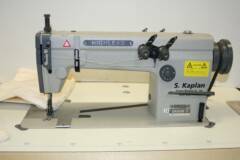 The SK-GC20618 Mattress Zipper Sewing Station is a heavy dusty double needle machine with built in puller for sewing single or double side zipper, concealed or exposed to mattress borders. Available in virtually any configuration required. 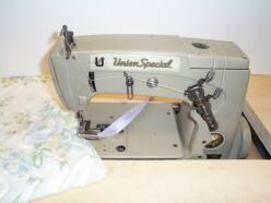 Multiple needle high speed Union Special 54400 machine with synchronized puller alllows for different trim widths. 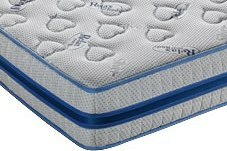 Contrasting tape can be sewn to mattress border. Adjustable for different border widths. Available as a manual machine or fully automatic with auto stop for material depletion and thread break detectors. Economical replacement Tape Edge sewing machine head for use as a spare or replacement upgrade. Can be mounted on most common machine carriages. Parts compatible with Singer 300UX type machine. 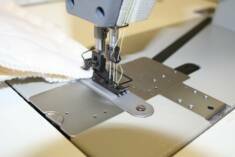 Each machine will be sewn with your border, binding tape and thread.